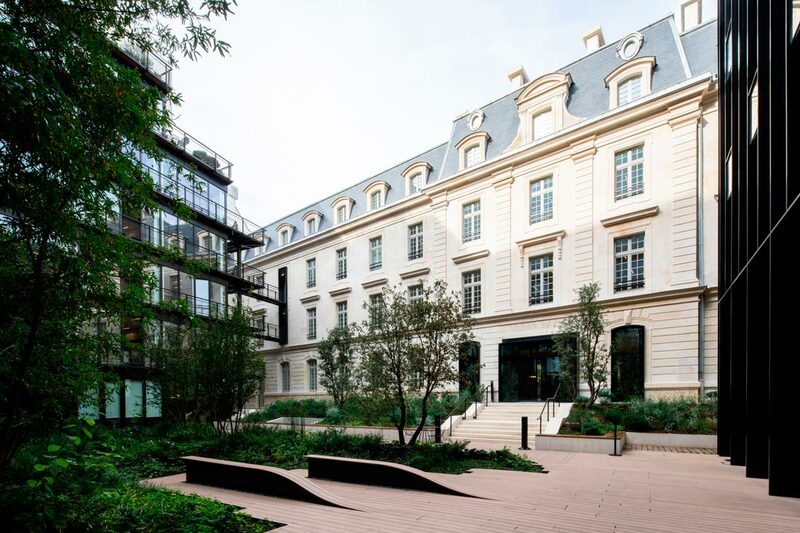 The creation of the new headquarters of Gide, the top French international business law firm, is one of the most important redevelopments in Paris in recent years. 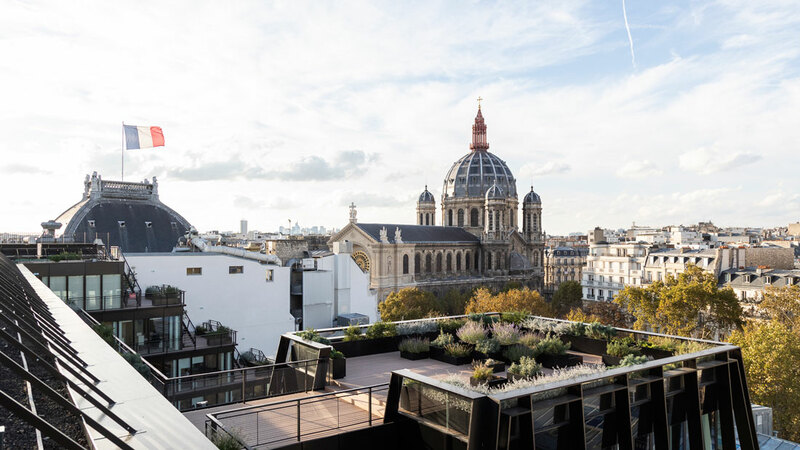 Situated on Place Saint-Augustin, the headquarters embody the “metabolic” reconstruction of Paris within itself, as well as the creation of new corporate spaces for fostering collective intelligence. The historic wing, which flanks the street, has seen its classical elegance and former grandeur of its 18th-century buildings restored. This wing is now dedicated to welcoming the firm’s clients. 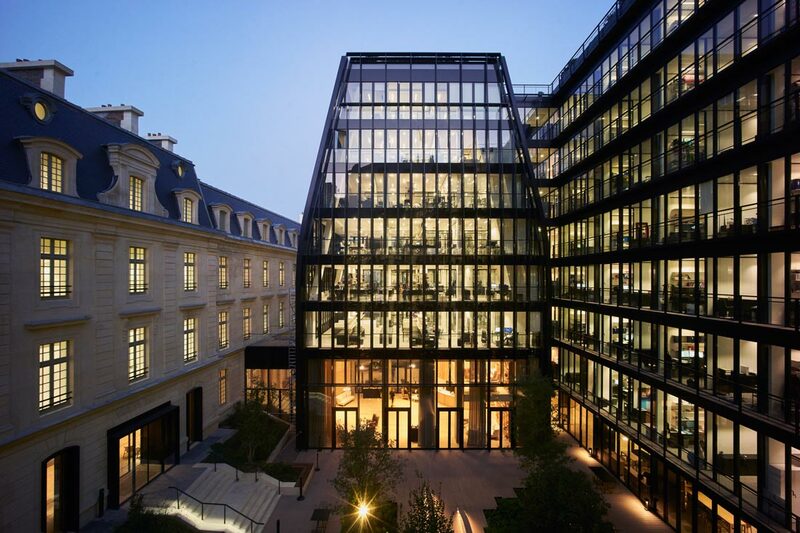 On the courtyard side stands a stunning office building, entirely rebuilt, with immense glazed surfaces supported by frames. Between the two, acting as a link between heritage and modernity, there is a monumental pavilion designed as a place to exchange ideas and hold events. Based on 15 years of research into the workplace topic, PCA-STREAM’s project is centred on the creation of a horizontal structure. The intention is to make a physical break from traditional vertical organizational structures. This is achieved thanks to vast open-plan floors, fluid circulation systems, glass offices and common areas (café, library, terraces), all set out around a veritable village square. As a result, Gide’s 600 lawyers and other members of staff meet and interact more frequently, information circulates, and synergies are reinforced. The new Gide headquarters boasts close to 4,500 m2 of outdoor areas, more than half of which is comprised of green spaces. This includes the garden, the planted terraces, the rooftop bar complete with its own kitchen garden intended for on-site consumption, and the external walkways on each floor. Thanks to modern tools and connectivity, these are mixed-use spaces for inspiration, exchange, and even production. These spaces also provide comfort, biodiversity, heat insulation, and environmental excellence. The tall, narrow barracks embodied the vertical hierarchy of the military. PCA-STREAM has turned this around to promote new, horizontal ways of working and managing. Circulation systems have been designed to allow fluid flow along the length of the building. The floors at the back of the courtyard have been widened to 12 metres. The lift cores are grouped together in one place so that members of staff encounter one another every day. The proportion of common areas has been greatly increased, with the creation of spaces designed for informal meet-ups: kitchens and convivial spaces on each floor; a contemporary restaurant with large tables, which during the day transforms into an informal space for work and collaboration; a vast library with alcoves, where both groups and individuals can come together in the same place; and a central building, the “NoPa”, designed as a hub for resources, discussion, and representation. A terrace crowns the pavilion, providing a venue for events. Made entirely of glass surrounding the courtyards, the structure allows its occupants to see one another, even from the opposite sides of the building. The whole space has been conceived to promote encounters, interactions, and knowledge sharing. This represents a genuine paradigm shift for the legal profession, which is based on discretion and confidentiality. The new staff offices remain individual (or are shared by two or three people), but the partitions are transparent, and some even have writable walls. The acoustics have been designed to guarantee that conversations are not overheard. Most of the offices benefit from dual access points, outdoor balconies, and terraces. Thanks to the floor-to-ceiling windows of the façade, each office benefits from optimal natural light. There is also excellent provision of outdoor spaces. Besides the central garden, the offices offer access to the balconies on every floor. The quiet of the courtyards, the planted terraces or two rooftops provide spectacular panoramic views of Montmartre, the Parisian rooftops, and Saint-Augustin church. Circulation is given prominence with staircases on the façades, transforming them into true living spaces: they provide access to the terraces, foster encounters, and encourage physical exercise. There are a multitude of informal and inspiring spaces, allowing people to work flexibly and in harmony with the seasons. Particular attention has been paid to design and furniture, particularly in the shared spaces, to achieve a very high level of comfort for both staff and clients. The work spaces’ interior design has been entrusted to Archimage. In addition to the double-height lounge, the restaurant, the working café, and the library, which together constitute a real living space, an on-site concierge service and 24-hour gym are also provided. 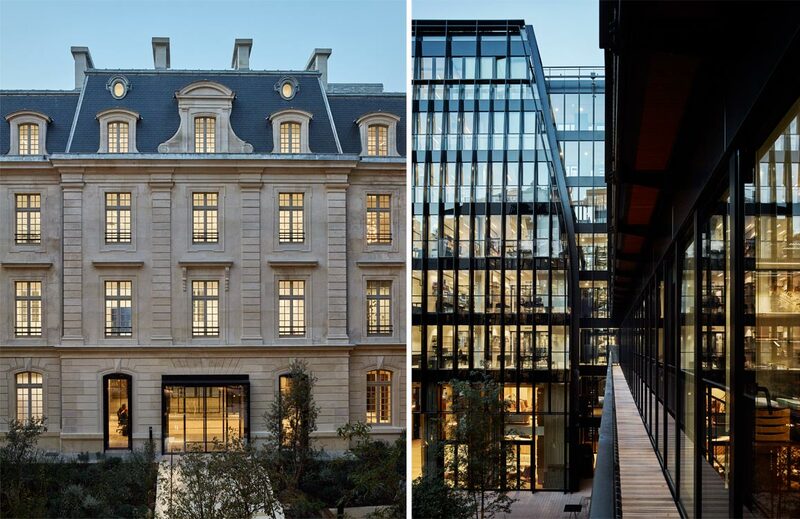 Resulting from the close collaboration between Gide and PCA-STREAM, the interior architecture is founded upon the major values embodied by the law firm: excellence, innovation, and the French art of living. The project therefore uses materials that are noble without being ostentatious: Charmot, blue Buxy limestone, and marble, with antique brass for the metalwork. Like a red thread, the sycamore bracket provides the project with rhythm. The common areas reuse the aesthetic codes of the home and the hospitality industry, with the addition of elegant curtains and the tailor-made choices of decorative objects and hanging lights. The new central “NoPa” pavilion opens onto a double-height hallway with a cosy design. The restaurant, the working café, and the library constitute welcoming coworking spaces. 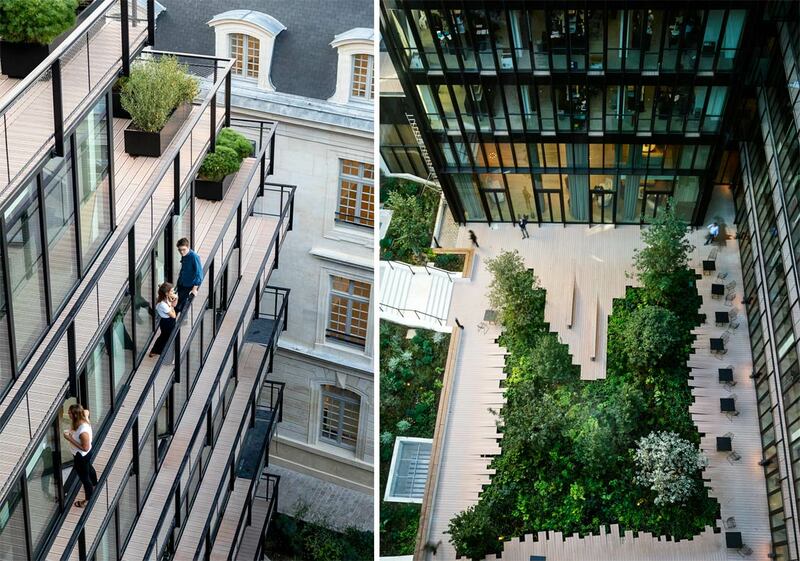 On every floor, the terraces and contemporary lounges form convivial islands between offices. An essential component of the project for Gide, the spaces dedicated to welcoming clients are located in the historic and most noble wing, flanking the street. The wing includes approximately 20 meeting rooms, elegant, comfortable and equipped with the latest technology, as well as small salons, open but discreet, mingling with digital artwork. STREAM has dedicated five years of research, two publications and dozens of conferences to the subject: office buildings – and the city as a whole – must be regarded as metabolic organisms: alive, co-designed, evolving, and connected to their ecosystems. Modern building design is driven by the desire for a new relationship with nature in urban areas, a relationship that is both simpler and more active. The creation of green spaces is no longer decorative. It now includes gardens, roofs, and terraces, creating porosity with the neighbouring Augustins park. It provides comfort, biodiversity, and heat insulation. Freed of technical structures, the rooftop becomes productive. Various aromatic plants grow there, requiring little watering and maintenance. They are cared for and harvested by Topager, gardener-agronomists specialized in urban agriculture. 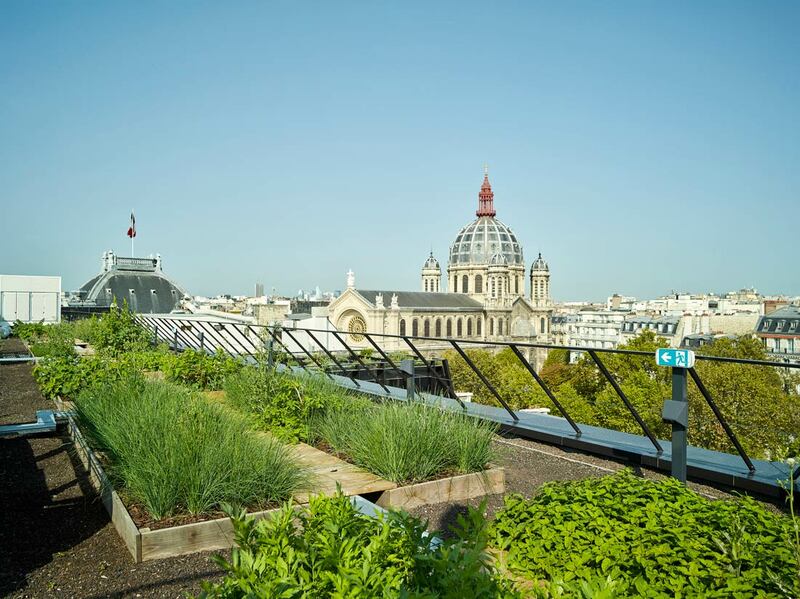 Though the amount of food produced, intended for on-site consumption, remains modest, it significantly improves urban biodiversity and optimizes rainwater management. The central courtyard is luxuriously planted, like an invitation to come and sit down to have lunch, to talk, and to work. The landscape project creates the impression that nature is erupting from the floor through the wooden platform. It was created by La Superstructure, which was selected in collaboration with the Chaumont Garden Festival. This approach is inherent to the culture of the studio, which regularly invites other creators, artists, and designers to take part in their projects. The entire project uses the available technology to offer exceptional environmental performance, approved by numerous certification labels, while contributing to overall comfort levels. This involves the careful choice of A+ materials (the top class of low-VOC materials), the collection of rainwater for sanitary facilities and watering systems, the use of certified wood from sustainably managed forests, as well as the installation of high-performance equipment to reduce the building’s energy consumption.